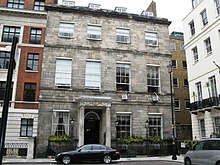 Chandos House is a grade I listed building at no.2 Queen Anne Street, Marylebone, in central London. It was designed by Robert Adam, the most prominent architect in Georgian Britain, and built by William Adam and Company. It is seen as the first of a series of large townhouses in London including 20 St. James's Square and Derby House. The house was built speculatively with monies from the Adam family and from the banker Sir George Colebrooke, later to be an Adam client himself. It was started in 1769 and finished in 1771 on a plot between another Adam house to the west, and the garden wall of Foley House to the east, on land which was part of the Duke of Portland's estate. The façade is of Craigleith stone, perhaps as an advert for the quarry to the west of Edinburgh on which the Adam brothers' firm had recently taken a lease. In 1813 the house was still home to Anna Eliza Brydges, Duchess of Chandos, whom the 3rd Duke had married as his second wife in 1777. However, following the sudden death of the Duke in 1789, the Duchess was declared a lunatic. As a consequence she was confined to the house and lost control of her estates. In May 1815 the unexpired portion of the lease (51 years) was sold by her executors and purchased by the Austrian embassy. The first resident ambassador was Prince Esterházy, and for the next 25 years Chandos was the scene of entertainment on the most lavish scale. Contemporary newspapers record his wasteful splendour and oriental pomp. Eventually his extravagance proved his ruin. He left the embassy in 1842 and was succeeded by Baron Neumann. In 1866 the Austrian embassy moved to Belgravia where it now houses the Embassy of Austria. Today Chandos House is owned by the Royal Society of Medicine, and its 17 bedrooms and 6 function rooms are open to hire for weddings and events. "Chandos House". Images of England. Historic England. Retrieved 2010-05-04. This page was last edited on 23 October 2016, at 13:18 (UTC).